I spent the better part of Monday at a new stone wholesaler in Tampa. It was my first visit to their facility and I was there to approve some slabs for a client. The wholesaler is the Stone Warehouse of Tampa (http://www.stonewarehouseoftampa.com/) and their slab room was a feast for the eyes. the Stone Warehouse keeps its inventory on their website --check it out and you'll see what I'm talking about. My client's counters will be fabricated and installed the the great folks at Cutting Edge Granite (http://www.cuttingedgegranite.com/) in Largo. Like all fabricators, Cutting Edge has a large collection of slabs on hand at any given time. Most times when I take people over to Cutting Edge, they fall in love with something they find there. But sometimes, we need to dig a little deeper into the supply chain. Granite is quarried from deposits located all over the world. At the quarry, the granite is cut into large cubes. The cubes are cut into slices, similarly to the way one would slice a loaf of bread. Those slices are referred to as slabs. The slabs are numbered sequentially and those numbers stay with the individual slabs until they end up as counters in some one's home. This sequential numbering system allows granite fabricators to match up a stone's patterns when a counter requires multiple slabs to complete. Granite is quarried by Mom and Pop operations the world over and its final price is a function of a particular stone's availability. The less common the stone, the more expensive it is. The granite industry uses four primary price levels that reflect this. In addition to the four primary levels, there are special categories for very rare granites and they tend to be priced on a case by case basis. Because granite is a natural product, no two slabs can be identical. Additionally, granite changes from slab to slab, sometimes profoundly. It is important that you not settle on a granite until you see actual slabs. Small samples cannot show you the large, swirling patterns present in many granites nor can they show you the tremendous range of colors possible on a single slab. Never buy a granite counter from a sample. Never. Granite as a material is relatively inexpensive. It costs what it does from the labor involved in transporting it, cutting it, polishing it, installing it, etc. 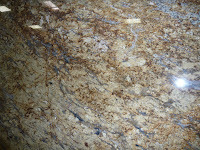 Granite from a reputable granite fabricator should start at around $55 a square foot. Beware low prices. A granite counter is only as good as its installation. Somebody who tells you he's only going to charge you $35 a square foot is going to make money somehow and the only place he has available to squeeze is labor. There are smart ways to save money and foolish ways to do so. Going with obviously low-ball bids is a pretty foolish way to make a project cost less. So my how-to hint about buying granite counters is pretty simple --call Cutting Edge.